Analysis of 20,000 mass grave sites by the DC-Cam Mapping Program and Yale University indicate at least 1,386,734 victims of execution. Estimates of the total number of deaths resulting from Khmer Rouge policies, including disease and starvation, range from 1.7 to 2.5 million out of a 1975 population of roughly 8 million. In 1979, Vietnam invaded Democratic Kampuchea and toppled the Khmer Rouge regime. The Communist Khmer Rouge regime arrested and eventually executed almost everyone suspected of connections with the former government or with foreign governments, as well as professionals and intellectuals. Ethnic Vietnamese, ethnic Thai, ethnic Chinese, ethnic Cham, Cambodian Christians, and the Buddhist monkhood were the demographic targets of persecution. As a result, Pol Pot has been described as "a genocidal tyrant." Martin Shaw described the Cambodian genocide as "the purest genocide of the Cold War era." Ben Kiernan estimates that about 1.7 million people were killed. Researcher Craig Etcheson of the Documentation Center of Cambodia suggests that the death toll was between 2 and 2.5 million, with a "most likely" figure of 2.2 million. After 5 years of researching some 20,000 grave sites, he concludes that, "these mass graves contain the remains of 1,386,734 victims of execution." A UN investigation reported 2–3 million dead, while UNICEF estimated 3 million had been killed. Demographic analysis by Patrick Heuveline suggests that between 1.17 and 3.42 million Cambodians were killed, while Marek Sliwinski suggests that 1.8 million is a conservative figure. Even the Khmer Rouge acknowledged that 2 million had been killed—though they attributed those deaths to a subsequent Vietnamese invasion. By late 1979, UN and Red Cross officials were warning that another 2.25 million Cambodians faced death by starvation due to “the near destruction of Cambodian society under the regime of ousted Prime Minister Pol Pot,” who were saved by international aid after the Vietnamese invasion. The judicial process of the Khmer Rouge regime, for minor or political crimes, began with a warning from the Angkar, the government of Cambodia under the regime. People receiving more than two warnings were sent for "re-education," which meant near-certain death. People were often encouraged to confess to Angkar their "pre-revolutionary lifestyles and crimes" (which usually included some kind of free-market activity; having had contact with a foreign source, such as a U.S. missionary, international relief or government agency; or contact with any foreigner or with the outside world at all), being told that Angkar would forgive them and "wipe the slate clean." This meant being taken away to a place such as Tuol Sleng or Choeung Ek for torture and/or execution. The executed were buried in mass graves. In order to save ammunition, the executions were often carried out using poison, spades or sharpened bamboo sticks. 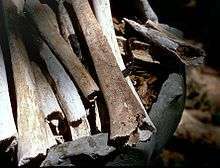 In some cases the children and infants of adult victims were killed by having their heads bashed against the trunks of Chankiri trees, and then were thrown into the pits alongside their parents. The rationale was "to stop them growing up and taking revenge for their parents' deaths." In 1997 the Cambodian government asked for the UN's assistance in setting up a genocide Tribunal. It took nine years to agree to the shape and structure of the court – a hybrid of Cambodian and international laws – before the judges were sworn in in 2006. The investigating judges were presented with the names of five possible suspects by the prosecution on July 18, 2007. On September 19, 2007 Nuon Chea, second in command of the Khmer Rouge and its most senior surviving member, was charged with war crimes and crimes against humanity. He faced Cambodian and foreign judges at the special genocide tribunal and was convicted on 7 August 2014 and received a life sentence. On July 26, 2010 Kang Kek Iew (aka Comrade Duch), director of the S-21 prison camp, was convicted of crimes against humanity and sentenced to 35 years' imprisonment. His sentence was reduced to 19 years, as he had already spent 11 years in prison. On February 2, 2012, his sentence was extended to life imprisonment by the Extraordinary Chambers in the Courts of Cambodia. 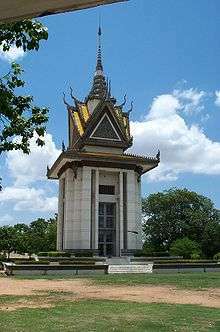 The best known monument of the Killing Fields is at the village of Choeung Ek. Today, it is the site of a Buddhist memorial to the victims, and Tuol Sleng has a museum commemorating the genocide. 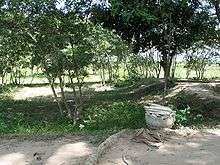 The memorial park at Choeung Ek has been built around the mass graves of many thousands of victims, most of whom were executed after they had been transported from the S-21 Prison in Phnom Penh. The utmost respect is given to the victims of the massacres through signs and tribute sections throughout the park. Many dozens of mass graves are visible above ground, many which have not been excavated yet. Commonly, bones and clothing surface after heavy rainfalls due to the large number of bodies still buried in shallow mass graves. It is not uncommon to run across the bones or teeth of the victims scattered on the surface as one tours the memorial park. If these are found, visitors are asked to notify a memorial park officer or guide. ↑ "'Killing Fields' journalist dies". BBC News. March 30, 2008. Retrieved May 25, 2010. ↑ Sharp, Bruce (April 1, 2005). "Counting Hell: The Death Toll of the Khmer Rouge Regime in Cambodia". Retrieved July 5, 2006. ↑ "CAMBODIA: Help for the Auschwitz of Asia". Time. November 5, 1979. ↑ McKirdy, Euan (7 August 2014). "Top Khmer Rouge leaders found guilty of crimes against humanity, sentenced to life in prison". CNN. Retrieved 7 August 2014.